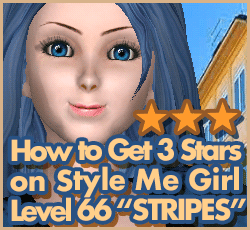 How to Pass Style Me Girl Level 66, "Stripes," & Get 3 Stars With No Cash Items! Level 66, "Stripes," is presently, the last level of Style Me Girl, and has been for some time now. We still hold out hope for new levels to come! The look I gave model, Annie, is certainly one of "stripes," and more importantly, it earned three stars without any cash items! To see how I got three stars on Style Me Girl Level 66, "Stripes," without any cash items, read on! How to Pass Style Me Girl Level 65, "Fabulously Sporty," & Get 3 Stars With No Cash Items! Level 65 of Style Me Girl is themed, "Fabulously Sporty," and features model Rachel at a tennis court. One might think it necessary to purchase the cash item tennis racket and ball in order to pass get three stars but this is not so. I got three stars for my sporty style and I didn't use ANY cash items! If you would like to know how to pass Style Me Girl Level 65 "Fabulously Sporty," and get three stars without using any cash items, you've come to the right place! How to Pass Style Me Girl Level 64, "Rainy Day," & Get 3 Stars With No Cash Items! In my case, getting three stars without using any cash items on Style Me Girl Level 64, "Rainy Day," theme required that I use several accessories, any one missing and three stars were not guaranteed. None the less, the rainy day style I gave model Jill worked. If you would like to know how to pass Style Me Girl Level 64, "Rainy Day," & get three stars without using any cash items, read on! How to Get 3 Stars on Style Me Girl Level 63, "Shorts," Without Any Cash Items! Level 63, "Shorts," of Style Me Girl, is another level that was more of a challenge as I went through and played each level again. My old style for "Shorts," themed Level 63 didn't get me the three stars I wanted, so I came up with an entirely new "All About Shorts," look, without using any cash items, that did pass and get the three stars I sought. If you would like to know how to pass Style Me Girl Level 63, "Shorts," read the full post to find out how I did it! How to Pass Style Me Girl level 62, Something Chic, With 3 Stars & NO CASH ITEMS! Initially, I could not pass Style Me Girl Level 62, "Something Chic," and get three stars unless I used at least one cash item, but I was determined to do it, I persevered and found a way! If you would like to know how I passed Style Me Girl Level 62, "Something Chic," with three stars without using any cash items, read on! Here you can see how I styled all levels of Style Me Girl & Teen Vogue Me Girl earning three stars *** & how I do so with little or no $ gold cash items! Best wishes to you in your quest to style Me Girl!